news Communications Minister Malcolm Turnbull has made a public statement which appears to have significantly undercut the stability of Australia’s telecommunications regulatory environment, winding back the potential for telcos such as TPG and Optus to invest in their own broadband infrastructure ahead of the rollout of the Coalition’s Broadband Network. In September last year, national broadband company TPG flagged plans to deploy so-called fibre to the basement infrastructure to some 500,000 apartments in major Australian capital cities, in a move which will compete directly with the new Coalition Government’s plans to conduct similar rollouts under the Coalition’s Broadband Network (CBN) scheme. Unlike Labor’s previous policy, under the Coalition Federal Government’s broadband policy, fibre will typically not be extended all the way to home and business premises. Instead, up to a third of Australian premises are likely to be serviced by extensions of the HFC cable networks owned by Telstra and Optus, while for a significant number of other premises, the Government is planning to deploy fibre to neighbourhood ‘nodes’, and then use Telstra’s existing copper cable for the remainder of the distance to premises. However, in documents associated with its financial results briefing in mid-September — shortly after the Coalition won last year’s Federal Election, national broadband provider TPG — one of Australia’s largest ISPs and telcos — revealed its own plans to skip the Government’s planned rollout and leverage its own fibre infrastructure to widely deploy a Fibre to the Basement option. The move was shortly followed by a similar announcement by Optus, which is examining its own fibre infrastructure to determine whether it may conduct a similar FTTB rollout to TPG. The previous Labor Government enacted so-called “anti-cherry picking” legislation designed to ensure telcos could not overbuild its previous National Broadband Network plan. However, it appears as though TPG and Optus are relying on a provision that allows existing networks to be extended by less than a kilometre. However, in comments made to the Financial Review this morning (we recommend you click here for the full article), Communications Minister Malcolm Turnbull appears to have called the legality of both rollouts into question. “It’s yet to be seen how much scope they’ve got for that,” the Minister reportedly said, adding that the issue would be examined by the Panel of Experts conducting a cost/benefit analysis of broadband and associated regulation. The comments throw both potential rollouts — likely representing investments worth at the least, tens of millions of dollars — into jeopardy, as they open the door for new legislation to stop the rollouts from going ahead, even if they are already partway through. The Coalition’s initial broadband policy stated that the cost/benefit study was due to be delivered within six months, meaning that it is not likely to be finalised before mid-2014, given that the Panel of Experts was appointed in mid-December. 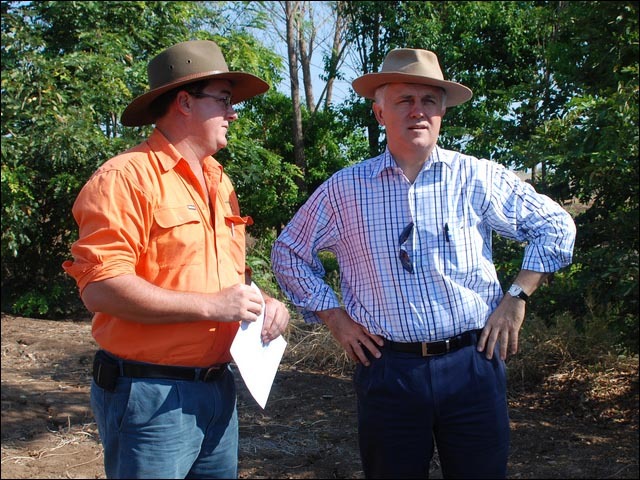 Turnbull’s comments come despite the fact that the Minister Malcolm Turnbull has repeatedly stated that he is in favour of infrastructure-based competition in Australia’s broadband environment — even in competition with the Coalition’s Broadband Network. Both network rollouts would be likely to provide infrastructure-based competition with the Coalition’s Broadband Network when it was eventually constructed, and hence undercut the finances of NBN Co in some regions. “Infrastructure-based competition is the norm around the world because it drives investment, encourages innovation and keeps prices lower,” a frequently asked questions document about the Coalition’s broadband policy states. It appears that this situation with regulatory uncertainty caused by Australia’s political sphere has happened previously with regards to Australia’s telecommunications industry. Internode founder Simon Hackett, for example, had publicly stated in September 2011 that if the Coalition won the 2013 Federal Election and cancelled Labor’s FTTP-based National Broadband Network project, then Internode could have listed on the Australian Stock Exchange and deployed its own fibre infrastructure further, in a similar vein as TPG and Optus are proposing. However, the ongoing uncertainty about how Labor’s National Broadband Network project and the Coalition’s evolution of that project, dubbed the Coalition’s Broadband Network, would be deployed appears to have held back those and potential plans by other telcos to invest in infrastructure in Australia. If I worked in strategic planning at either Optus or TPG, I would have been horrified to read Turnbull’s comments in this morning’s Financial Review. The Minister has essentially publicly threatened to modify Australia’s telecommunications legislation to make the Fibre to the Basement network rollouts which the two telcos have been discussing illegal, but six months in the future. I don’t know how any Australian telco is supposed to make plans to deploy any infrastructure under those conditions. This is the very definition of regulatory uncertainty: Businesses which need to make decisions about where to invest their money and better serve customers are having those plans undercut by successive governments which appear unable to put in place a long-term stable framework for Australia’s telecommunications industry. Even the Australian Competition and Consumer Commission has largely OK’d TPG’s rollout. And yet, our Communications Minister appears to believe it is perfectly fine to put commercial deployments by companies such as TPG and Optus on hold — delaying better services to customers and potential profits for those companies’ shareholders — while he decides how precisely to tinker with laws in this area. What’s worse is how flippant Turnbull was about the whole issue. Tens of millions of dollars could be being invested by the private sector in better broadband — an objective the Minister has said he supports, to develop infrastructure-based competition. But now it’s ‘only an issue to be considered within six months’, and Turnbull appears to have abandoned his principles. “If there is one thing Australia desperately needs right now, it is for our elected representatives to stop making dramatic changes to our national telecommunications policy every few years and to come together around a set of universally agreed projects. The alternative is another half-decade worth of pointless wasted effort and industry chaos. Thing is, that legislation existed prior to TPGs opening gambit. They, like Optus, have presumed the death of NBNCo would mean open season and that Turnbull would just reverse it. He hasn’t. He cannot, in fact, do so and have NBNco remain viable. Given the reiterated comittment to stay the course on mixed model, he is absolutely unable to sacrifice any wholesale market. So we have the slightly unusual situation when a sitting liberal government is resisting market led pushes to gain market exclusivity. Of course ACCC don’t care, they’ve already set the precedent that infrastructure competition is enough (mostly) to avoid having to wholesale. tl;dr – most saw this coming. The current legislation allows it Brendan. Malcolm is talking about changing that (at some time in the future) to stop them (possibly). Not really surprised. However being fun loving free capitalist, The government should be praising and rewarding . Optus and TPG. After all, the NBN was created because the government could not get private enterprise to fund and build it. And servicing apartments is one reason this occurred! This seems to go against the Libs ideology of letting private business provide solutions – TPG and Optus appeared to be taking the initiative that seems to be encouraged by the Liberal Party, and now they’re risking being cut off at the knees. Mixed Messages. Maybe this indicates the beginnings of a u-turn back towards FTTP, or at least the future upgrade of FTTN to FTTP? Renai, are you able to get into the audience for Q and A next week to ask a couple of hard questions? In my opinion, complex regulatory issues like this cannot be meaningfully discussed through populist avenues such as Q+A. but the only real way to affect change is to embarrass, annoy, and load them up with that much crap around them they have no choice but to change. That is the only real way nowadays unless its an election year. Unfortunately it seems complex regulatory issues like this cannot be meaningfully discussed with politicians. It makes me want to throw things at the TV \ radio. On balance, the amusing musings of Barnaby Joyce often sound a lot more genuine and sensible than the stream of misleading platitudes from the supposedly highly intelligent Malcolm Turnbull. I’m sorry but I’ve got to ask. Does anyone here think that if T$ were making the FTTB play that there would be any issue? Yeah, my cynical side was thinking the same. I think there is a small error in the article. You mention Simon Hackets 2011 comment, but you reference the 2013 election. Perhaps you meant the 2010 election? From memory, Hackett’s comment came after the 2010 election and after Abbott announced that he and Turnbull intended to destroy the NBN. As an aside, don’t you only get infrastructure competition where there are two or more sets of infrastructure? Aside from duplication driving up prices, hasn’t the recent history of telecommunications in this country been about avoiding competition with Telstra at all costs? So if Telstra installs, who else in their right mind would? Ugh another kick in the guts, man I can’t believe this guy. Kinda makes me wonder, what is the cost of him changing the roll out mid way, and did they factor that cost in at all? They don’t want fibre anywhere, it threatens their buddies in big business. news, movie, music and television industries all have good reason to not want super fast reliable internet to be deployed here. I knew this day would come, where politics has stifled the progress of the NBN. Business doesn’t have time to play games, they want to deliver new services and beat the competition to it. No doubt the large ISP’s every day are plotting how to get an advantage over the NBN. Sigh. And I thought things couldn’t get any worse than a patchwork of overbuilt networks all competing with each other until the biggest player runs the others out of business wasting billions of dollars that could have been spent on better services. Before anyone chimes in saying they aren’t tax payer dollars being wasted – it doesn’t mean dollars can’t be wasted – especially since they are still our dollars since we have to pay higher prices for services to make up for the waste. You are absolutely right. The buck most likely will get passed, and ultimately charged to the end user. This is not the first ive observed this… but its as if the lnp are going through para by para and rewriting every one with the worst option possible, the most obstructive, complex and money sucking – as long as its not governmental money – options possible. What a clusterfk. Its totally deliberate, vindictive and juvenile on their part – the whole ‘we’re doing it this way because its not-labor’ is juvenile – and we are the ones who will have to wear the fallout from it. “Turnbull appears to have abandoned his principles.” – I thought this was already a fact based on your earlier apology post. On the flip side, I think it’s best to stop all investment in broadband as I don’t want to see apartment dwellers getting a broadband advantage over me who lives in a house. Honestly, I don’t know why I even bother reading about the NBN anymore. The NBN is dead. The NBN board seem to all be yes-men – with the potential exception of Simon Hackett. It was a nice dream for a while. There is a tendency that sketch web design will be used in future even more often. Combine this with an OTO and it’s not too difficult to profit from a high percentage of people who opt-in from your squeeze page. You can take full advantage of contrast by changing font size, weight and family to provide textual contrast and varying sizes of images and elements.